Cinchapi wins Atlanta Startup Battle 2.0. Real-time insights with the power to act when it matters. The comprehensive data discovery, analytics and automation platform powered by machine learning. Cinchapi's #AskSeeAct workflow transforms your entire company into a data-driven enterprise. Explore Data Using Natural Language. Forget structured queries. Cinchapi turns natural language into precise insights on demand. Cinchapi understands all kinds of natural language – right down to company-specific jargon. And when you need to drill deeper, simply ask follow up questions to hone in on the right data. Cinchapi continuously learns from implict and explict user feedback. So over time, the platform begins to anticipate your data needs before you even ask. Cinchapi does analysis across data dimensions to curate the most relevant trends, patterns and relationships. 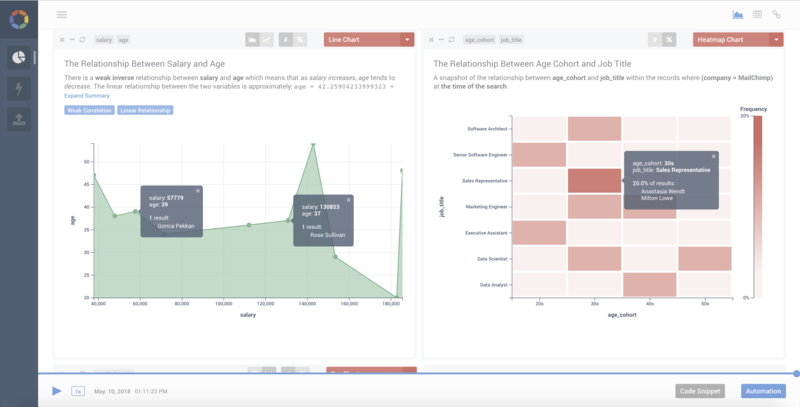 Visualize insights from historical and real-time data. Cinchapi does all the number crunching and highlights the most important insights, so you focus on the signal instead of being distracted by the noise. Cinchapi uses a combination of machine learning and advanced heuristics to enrich your data with additional context. Cinchapi's version-control database allows you to pause or rewind real-time data and explore every possible dimension in depth. Automate workflows with a few button clicks. Use an intuitive workflow builder to automate business processes that respond to data changes in real-time. Cinchapi is built on an innovative platform that developers can easily extend to deliver wins for the business. Sign up for a free trial of the Cinchapi Data Cloud to start turning data into insights and insights into action. Subscribe to the Cinchapi newsletter to stay up-to-date on news, local events and product releases. © 2018 Cinchapi Inc. All Rights Reserved.